Deliver targeted, relevant emails to your subscribers. 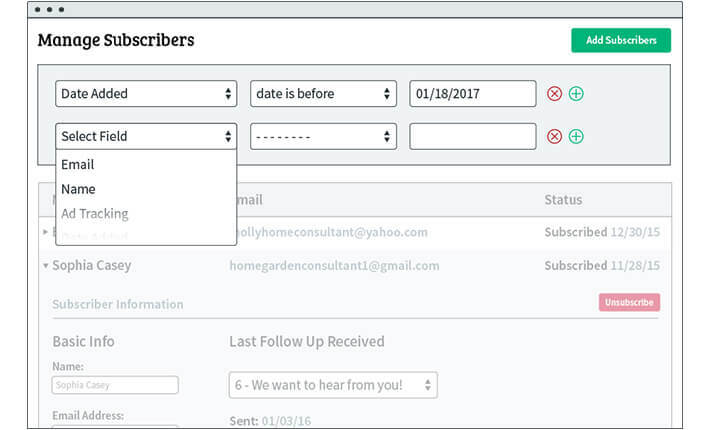 Use tags and custom fields to create dynamic subscriber segments to send more relevant and personalized content to your audience. Sending the right email content to the right person exactly when they need it can increase your profitability and sales. Create subscriber segments based on activity. Manually and automatically apply tags to create dynamic subscriber segments. Who opened (or didn't open) a specific message. Who clicked a certain link in a specific email. What products they bought and how much they spent. What pages subscribers visited on your website. Location or region based on IP address. Custom information collected at sign up like age & gender. With the Sign Up Form Builder, it's easy to request specific information (name, email and up to 25 other fields) from your prospects and use that to segment once they're on your list. Apply tags when subscribers are added from a specific form, or apply custom tags based on custom form field responses. Segment your list based on reader activity for higher profitability. Your subscribers are unique - treat them that way! Segmenting ensures they only receive content that is relevant to their needs. As a result, you have more engaged readers, better click-through rates and more sales. On your sign-up form, you can include fields for prospects to enter their location, a product or service they're interested in, or any other information you want to collect. Once you have that, you can send targeted, personalized emails to different groups.